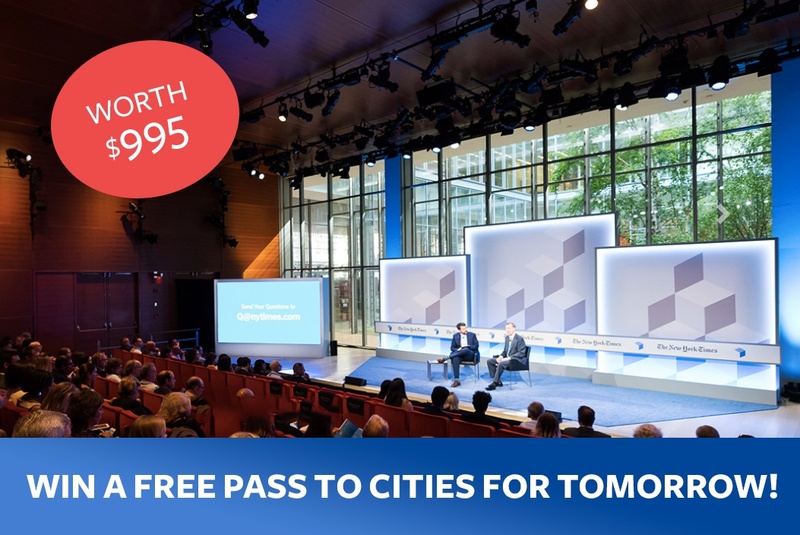 Cities for Tomorrow is back for its fourth year, and 6sqft has teamed up with the New York Times to give one lucky reader a free pass (worth $995!) to the event taking place July 10th–11th in Midtown Manhattan. Join creative visionaries and leaders in the real estate, urban planning, and political fields such as Momofuku founder David Chang, former Massachusetts Governor William F. Weld, NextGen Climate founder Tom Steyer, and filmmaker Barry Jenkins as they discuss topics ranging from the new power of private money to the future of bricks-and-mortar retail, from cities’ impact on the national climate agenda to the realities of leading during a time of partisan politics, from the promises and pitfalls of smart technology to fresh approaches to entrepreneurship. HOW TO ENTER: All you have to do is sign up for our newsletter here. If you’ve already signed up, simply leave a comment below telling us what topic off this year’s agenda interests you the most. The deadline to enter is 11:59PM, Thursday, June 29th, and we will email the winner on Friday, June 30th. Good luck! Those interested in purchasing a ticket can register here and get 20 percent off the admission price. Build It and They Will Come! I want to hear anything David Chang has to say. Build it and They will Come!!!! Hi, I’m so excited about this contest. The topic that interest me the most is Cities As Stars with David Simon from one of my all time favorite shows – The Wire. If anyone is going to talk intelligently and knowingly about a cities forgotten class it’s David Simon who has spent much of his career first reporting about it and then creating television series around the same premise. New cities should be for everyone not just the 1% and I love to attend this event around this conversation! This is an exciting contest and I can appreciate how many people would want to attend. As someone who has taught urban history and design for many years at both Colleges and Universities I am deeply appreciative of the importance and uniqueness of such an event. It is truly another one of those reasons to be a New Yorker and live in the center of the universe. I am quite perplexed about the wide range of topics that will be discussed. I can’t decide which one is better, because they all are fantastic! I am so excited to have moved to a city that is so active in developing a better place for everyone living in it. I walk almost 10 miles every day only to see what new things will be developed and how they fit into the overall vision of the city. I would be interested as to how implementing relocation policies would encourage both economic and geographic mobility. Interested in how AR and VR can be used to better visualize and understand real estate development projects. Hello – I’m all about keeping abreast on the rapidly emerging challenges in the industry. Thank you for the opportunity to win a free ticket; hope to see you there! We need out-of-the box thinking as the city expects to grow; Housing, moving and educating 9 million people will be an amazing challenge. Build It and They Will Eat since we are seeing this develop in real time in NYC. Very interested in the future of Real Estate Development and how those projects can be visualized using digital mobile media. Very interested in the Taking the Lead session. NY leads in many areas, but could learn a thing or two from other developing cities. Ms. Barbacci: A most interesting project that you’re involved in. Can you provide a link for more information? The future of Cuba is also of great interest to me. As a new real estate agent in Manhattan, I find 6swft.com a fantastic daily dose of market news! Regarding favorite topic, I am most interested in “climate” and “business.” Thanks. I am most interested in transportation. I am most interested in New Modern high rises! Urban Development and Community Engagement in rezoning. The Path to Moving Up? I’m most interested in restoration of natural ecosystems in city parks and backyards, as well as avoiding the most destructive and carbon-intensive materials used to build cities. Interested in much of the program, especially ‘The Art of Compromise (or Not)’.